Renditions made with fresh tuna fish, potatoes, hard-boiled eggs, cheese, or shrimp often found their way onto my plate since they’re generally gluten-free, but Shawn and his parents enjoyed pintxos protein resting atop a crispy slice of a baguette. I haven’t yet been to Madrid, but I’m guessing the tapas scene is quite fun there? Last month we stopped in to Logroño, known for having more than 50 tapas spots within a few blocks of each other. Loved the atmosphere, and the variety! There is always so much pressure related to entertaining. This is a wonderful concept with the food prepared ahead of time and people would just graze their way through the evening. You wouldn’t even have to set a table. Just lots of big napkins and voila – dinner is served. It’s always nice to have an excuse to return! We’d also like to go back so that we could see the fishing villages on the coast. What places did you enjoy in the Basque country? I only went to Bilbao and then took a small regional train to Leon to jump on the camino. We stopped with the train in villages I can’t remember the name of anymore… would be nice to explore the area more! Ah, we’d love to do the Camino someday! How much of it did you walk? Several years ago, we stopped in to Santiago de Compostela, which was our first introduction to the Camino. I remember the pilgrims with their walking sticks, the shell symbols emblazoned on buildings and souvenirs, and the Botafumeiro being rapidly swung inside the cathedral. Of course we also enjoyed our fair share of beautifully-arranged tapas! We walked from Leon to Santiago. Next time, whenever that might be, I’d do the start though ;) I did a blog post about it too, if you want to take a look. It’s awhile ago though, I also spent a few months traveling Spain back the, also enjoying my fair share of tapas! Please feel free to share the link to your post about the Camino here in the comments. :) We’d love to do some, or all of the walk one day, so welcome pointers too. Another pointer is, that even if it is easy to buy food on the way, it is not an easy region for vegetarians. If you are a vegetarian, you may want to take nuts etc with you. Also, cooking facilities in the refugios are minimal or nonexistent. Sounds like an adventure in so many ways, and a fine way to learn Spanish and get fit. I appreciate your pointers as well. I have a colleague who did the Camino, and she said the lesson she came away with from it is that you don’t need many material items to survive. Living a minimalist life on the Camino illustrated that for her. I agree with her. But then I was backpacking for a few months back then anyway, so the difference wasn’t huge for me. But it was so much fun! I am hungry for pintxos again! It’s all very mouth watering, should have had dinner before grazing through your post. Happy Summer to you, Tricia. Cornelia, I’ve been hearing that a lot lately. Perhaps it’s time I tell more stories about our active adventures so we’ll motivate dear readers accordingly. :) Hope you’re enjoying a relaxing weekend! Terri, tiny bites are a fun way to explore a cuisine, and potentially better for the waistline, aren’t they? :) When were you two in Bilbao? 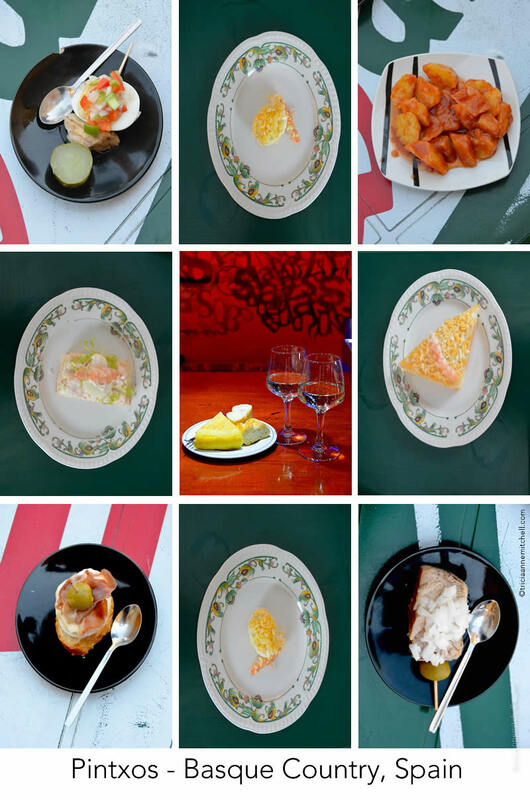 We especially loved going on the pintxos / tapas trail in Logroño. There were many tapas bars packed into a few blocks and the locals were in such a celebratory mood – enjoying good wine, food, friendship, and a sunny Saturday afternoon. Shawn and I keep hoping that we’ll have the chance to participate in a grape harvest. Something tells me that you and James have probably already done so! Hauled hay – where? :) That sounds like a post in the making.